Happy Easter! Hope everyone enjoyed the long weekend! I started out with a pastel easter tribal mani in my head as I had time on my hands but it didn’t work out. 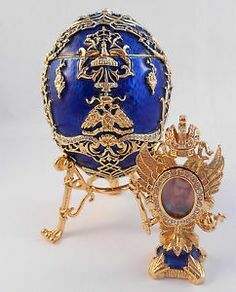 So I searched around a bit for inspiration and remembered the famous Fabergé Eggs I had studied in school. These were bejewelled Easter eggs made by Peter Carl Fabergé for the Tsar Alexander III and later his son Nicholas II. Each egg was made to carry a ‘surprise’. Out of the 50 made, only 43 remain today and quite a few of the ‘surprises’ inside are lost. Needless to say, they are exquisite (even if you’re only looking at a picture of them). I searched around in my stash for the perfect royal blue polish. I finally settled on using Revlon Royal for this mani. 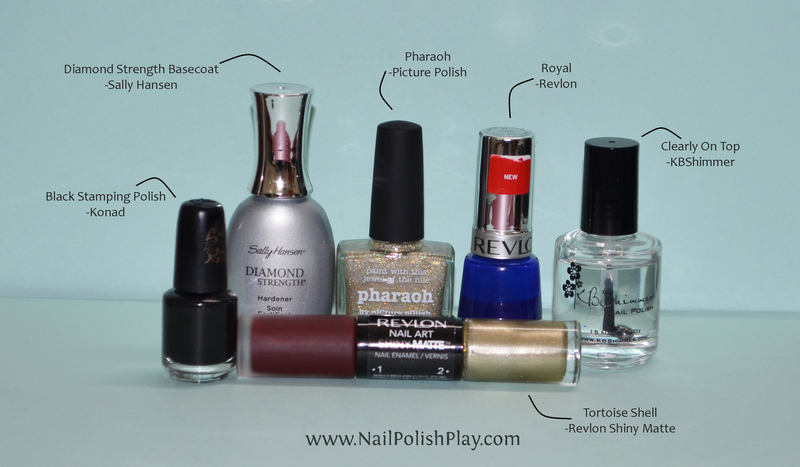 Now, speaking of Revlon Royal, I have nothing against the colour, application, brush etc. Everything’s a breeze. What’s not, is the “fragrance” of the polish. I use the term fragrance very loosely indeed as the polish let off a smell that’s frankly very unbearable. I’ve read it described as “skunky” on other blogs, but to me it smelt like rotting marigold. I think it has something to do with the pigment they’ve used to colour the polish. Anyway, other than that, the polish is just perfect! It’s a deep indigo jelly, perfect to give that enamel finish.Thankfully, the smell fades away after you’ve put topcoat! I used piCture pOlish Pharaoh for my accent nail as it’s the perfect white gold with that magical scattered holo effect! I have a thumb too!